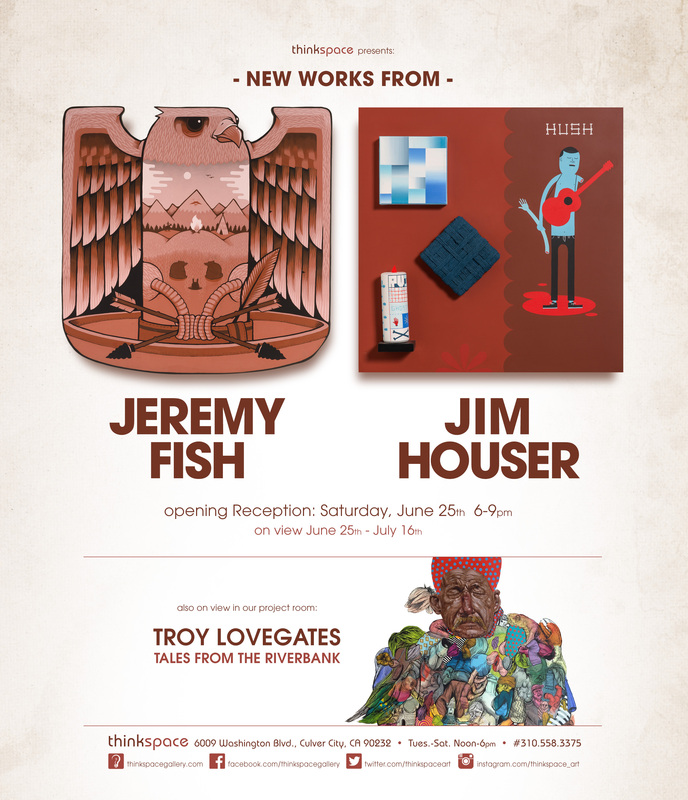 On view in the Thinkspace project room are new works by Canadian artist and street muralist Troy Lovegates in Tales From The Riverbank. Lovegates, AKA Other, creates intuitively from a wealth of collected impressions and unexpected associations. He allows his pieces to come together unexpectedly from these collected “patches and chunks.” His works are meticulously rendered, however, and strategically chaotic. 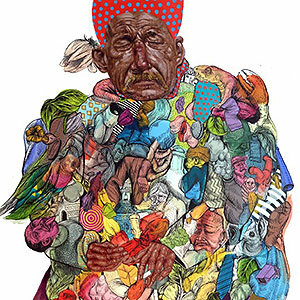 Graphically manifold, they combine unlikely elements and figures, held together by his use of linear detail and technicolor palettes. Combining figurative realism with graphic patterns and abstractions, Lovegates creates a world of imaginative, larger-than-life fictions. With a knack for the use of found materials and the unification of wildly disparate elements, both material and aesthetic, Lovegates uses everything from spray paint and oil stick to acrylic and ink to create his paintings. His sculptural works convey his signature aesthetic with hand-carved wood pieces, bringing his paintings to dimensional life as objects. A self-described “collector of lost souls,” the powerfully weathered people in his imagery are often real, captured through photographs and observation taken while on his travels. Inspired by his own dreams and nightmares, Lovegates’ works are emotive arrests of an awe-inspiring imagination.